What’s Happening Inside an Arthritic Joint? Rheumatoid arthritis means a joint is inflamed because of some abnormality of the immune system. Rheumatoid arthritis is extremely rare in the dog, and will not be discussed here. Septic arthritis is caused by an infection in the joint. This will also not be discussed further here. Osteoarthritis is very common in the dog. It’s also known as degenerative joint disease, which is a more descriptive term, and gives you some indication of what is actually going on in the joint. In most cases during a consultation, when we talk about arthritis, we actually mean osteoarthritis. In this article I will refer to osteoarthritis simply as “arthritis” from now on. In the dog, arthritis is the sequel to one of many joint insults. This could be an injury, such as a ruptured ligament, or a broken bone; or it could be secondary to a developmental problem, such as hip dysplasia. Whatever the cause, arthritis has several features which together result in the symptoms which we see. Firstly, many dogs with arthritis have absolutely no symptoms at all. This is a difficult concept for many people to grasp. Just because a joint is arthritic, it does not follow that the dog will be in pain or lame. In fact, arthritis can be said to be an attempt by an affected joint to stabilise itself. Many of the causes of arthritis result in an unstable joint. During the early phase of the disease, the dog may well be lame, and have inflamed joints. However, the joint then becomes stabilised by a mass of new bone forming around the joint. The joint will be less functional in this state, with a much reduced range of movement, but pain and lameness may not be a feature, although an abnormality of gait (the way a dog walks), may be seen by the trained eye. Having said that, pain in the affected joint is the major feature in an arthritic joint. Other symptoms include an unwillingness to move the joint. So, if it’s in a limb, there may be lameness; if it’s in the jaw, reluctance to open the mouth; in the spine a reluctance to move the head or back. What’s Happening in an Arthritic Joint? To understand what’s happening inside a diseased joint you first need to know a bit about what a normal joint looks like, and how it works. In this picture you can see that a joint is formed where two or more bones meet. Some joints are very complex, involving many different bones, but the basic principle is the same. On the end of each bone is a thin layer of a specific kind of cartilage, known as hyaline cartilage. This has a special property in that it can hold a great deal of water within its substance. In fact, normal hyaline cartilage is about 80% water, as opposed to only about 65% water for the body as a whole. Surrounding the joint is a tough fibrous structure called the joint capsule. Most joints also have ligaments supporting them, either within the joint itself, or overlying it. Between the two bones is a very small amount of fluid, called synovial fluid, which bathes the hyaline cartilage. It is held in place by the joint capsule. The property of hyaline cartilage of being able to hold a large amount of water is very important. It gives the cartilage a high degree of stiffness and turgidity. Added to that, when pressure is applied to the joint, a small amount of this water is squeezed out onto the surface. This lubricates the motion of the two bones across each other, and is more important in this respect than the synovial fluid always present within the joint. In a degenerate joint, a number of things happen to the hyaline cartilage. Firstly, the complex matrix of the cartilage starts to break down, and it loses the property of being able to hold water. So, when the two bones move across each other, the degree of lubrication is reduced. The joint tries to combat this by producing extra synovial fluid, which is evident by joint swelling. Unfortunately, synovial fluid within the joint space is a less effective lubricant, and the cartilage itself begins to wear away due to the friction of movement. The cells within the cartilage try to respond to this by producing extra matrix compounds, but they are destroyed faster than they can be produced. As the cartilage wears, small fissures can form, resulting in exposure of the underlying bone, which responds by laying down extra calcium, becoming denser, and harder. These fissures can enlarge, and quite large areas of bone become unprotected. Microscopic fractures form within the spongy bone that underlies the cartilage. At the junction of the bone and joint capsule, the bone itself starts to proliferate, resulting in bony projections which we call “osteophytes”. Osteophytes stretch the joint capsule, which becomes thickened. Together, this results in a decreased range of movement for the joint. From this description, you can begin to appreciate why degenerate joints are painful. Bone exposure, joint capsule stretching, and microscopic fractures. In addition, the joint capsule can become abraded, and the muscles surrounding the joint can go into spasm to protect it. Both of these are painful. The single most important thing that we can do to help a dog with arthritis is reduce its weight. Reducing the dog’s weight is enough to control all of the symptoms of arthritis in many dogs. The vast majority of dogs with arthritis are obese, many seriously so. This comes about through years of overfeeding, possibly by only a small amount. Keep a regular watch on your dog’s weight. At Vetrica, we are happy to weigh your pet as often as you would like for no charge. Even if your dog is not currently overweight, small, regular increases in weight mean you are feeding it too much, and you should reduce the dog’s food intake accordingly. If you’re having difficulty controlling your dog’s weight, please ask to see one of our qualified nutrition councillors, who can help you to improve your dog’s quality of life through careful dietary control and regular monitoring. This service is free. The rule with arthritis is that exercise is good, but too much is bad. The reason for this is that exercise (and hence use of the joint), stimulates the normal growth and maintenance of the cartilage. If an arthritic dog is kept confined for long periods, the degenerative changes which are occurring within the joint are accelerated. Overuse of the joint on the other hand is just as bad. The increased forces across an already damaged joint will damage it further. The microscopic fractures in the bone ends can enlarge, and the reduced lubrication of the joint means that friction damage of the cartilage occurs. In the morning the dog has just had a long rest, with minimal use of the joint, so the joint is in pain. As the dog gets moving, especially in the early part of exercise, the lameness disappears. The dog has “Warmed out” of the arthritis. This shows how light exercise improves joint function. As the duration of exercise increases, the dog may become lame while actually moving, or more commonly, just after a short rest. This shows how heavy exercise is bad for joint function. How much exercise is good? There is no easy answer to this question, and it varies between dogs. As a starting point, I recommend three or four 10-15 minute walks per day. No fetch or chasing games, just allowing the dog to go along at its own pace. If the dog tires or becomes lame while out walking, then you’ve gone too far; remember to go out for a little less next time. If there are no problems after 2 – 3 weeks of light exercise, you can try increasing the amount of exercise that you give the dog, but only very gradually. What is particularly bad, is taking the dog out for short, vigorous walks during the week, throwing a stick to tire it out, followed by a long walk at the weekend. The perfect drug for the treatment for arthritis would return a joint to its normal state, be inexpensive, and free of side-effects. Unfortunately no such treatment exists. Most of the drugs available to us relieve pain and nothing else. Some actually make the joint worse, despite relieving pain; while others do help to restore the normal structure of the joint and its cartilage. Pain killers are the mainstay treatment for arthritis, and have been for a great many years. Most of these belong to a family of drugs called NSAIDs (pronounced en-sayeds), which means Non-Steroidal Anti-Inflammatory Drugs. There’s a tremendous range of these on the market, and new ones are frequently introduced. In addition, no one drug is universally effective. All have a slightly different effect in any one dog, so if one drug doesn’t work, then we simply try another, and another, until we find the best drug for the dog. Paracetamol – this is very safe in people and dogs, but a single dose of a quarter 500mg tablet can be fatal to cats. Ibuprofen – this is very safe in people, but toxic to dogs. Phenylbutazone – this is very safe in the dog, but was banned for use in man (except for certain special circumstances), because of serious adverse effects. It is very important that you do not give any pain killer to an animal without veterinary advice first. It’s best to insist on being prescribed a veterinary licensed product on all occasions. These have been shown to be safe and effective in the target species. In the UK, it is mandatory that the vet uses a licensed product before considering an unlicensed one. Vetrica only uses animal licensed NSAIDs. See below for a list of NSAIDs that should not be given to dogs. This is currently the first choice NSAID for the treatment of arthritis at Vetrica. It has an excellent safety profile, rarely causing vomiting or diarrhoea. It is very effective in most patients, and is presented as a liquid with its own dosing syringe, marked with the dog’s weight on it. This means that very small dose adjustments can be given to achieve the minimum effective dose with long-term use. More importantly meloxicam doesn’t have any adverse effects on joint cartilage, (and may even have a positive effect), which means it is very suitable for long-term use. Most animals undergoing surgical procedures at Vetrica receive meloxicam by injection because it is such a good pain killer. Carprofen is an excellent pain killer, and side-effects are very rare, though more common than with meloxicam. Dose adjustment is not so easy because it is only available as 20mg and 50mg tablets. At Vetrica, we currently use carprofen as our second choice drug for the treatment of arthritis. Ketoprofen is a good pain killer, but unfortunately, it can only be safely given for 5 days. This makes it unsuitable for the long-term treatment of arthritis. PLT is a mixture of two drugs. Cinchophen, a fairly mild NSAID, and prednisolone, a steroid. The combination works very well, but we tend to reserve PLT to cases where other NSAIDs have failed. Piroxicam is very closely related to meloxicam. It is unlicensed for use in animals in the UK, but was used extensively before meloxicam was introduced. It is much cheaper than meloxicam, but also considerably more toxic. Vomiting and diarrhoea are quite common. It has a much greater potential for damaging the kidneys than meloxicam. It is however an excellent pain killer, and only needs to be administered once every 2 days. This is the oldest NSAID in use. It’s cheap, and available from practically every grocer’s shop in the UK. In the dog, aspirin is quite good as a pain killer, but vomiting is common. Giving the drug with food helps to prevent vomiting in some individuals. Aspirin can also hasten the course of arthritis, because it inhibits the production of important proteins within cartilage. It does not have a veterinary licence in the UK, and it is generally better to use one of the more modern drugs with a better safety profile. (Also note: aspirin must not be given to cats except on specific veterinary advice). Like aspirin, paracetamol is cheap and readily available. It appears to be less effective as a pain killer than aspirin, but vomiting is usually not a feature. Although paracetamol is classified as an NSAID, it has no anti-inflammatory effect. In the UK, paracetamol alone is unlicensed for use in dogs, but it is licensed with a combination of codeine, and is marketed as Pardale®. Care must be taken when calculating the dose, as it can be fatal if used incorrectly. In small dogs, it is very easy to give a toxic dose. For instance, one 500mg paracetamol tablet could be fatal to a Yorkshire Terrier weighing 2kg. This is not a complete list of all the NSAIDs that are unsuitable for dogs. If you are taking an NSAID for arthritis, and you think it’s the best thing ever, it does not mean that it will be good, or safe to give it to your dog. There are so many different NSAIDs available for use in man, that it is impractical to list them all here. Inhibition of phagocytosis, (a phagocyte is a white blood cell which destroys bacteria, and foreign proteins, and is an important part of the immune system). Animals under 6 weeks old. Having said all that, there are frequently instances when we are faced with giving an NSAID or euthanasing a dog because it is in pain. For instance, an old dog with kidney or heart disease way well also have marked arthritis and pain. It would not be ethical to let the dog suffer because the NSAID might make the kidney disease worse. The dog has to live an acceptable quality of life, and if this means using a drug which could shorten that life by an indeterminate degree, but give it a greatly increased quality, then that’s what we should do. Meloxicam and carprofen are relatively kind to the kidneys, and the risks are low in the majority of patients. There are two main type of “steroid”. There are anabolic steroids, that increase muscle development, for example, and corticosteroids, that are involved in the stress response within an animal. Anabolic steroids are not of interest to us here, and will not be discussed further. For the purposes of this article, we will simply refer to corticosteroids as “steroids” from now on. For a full discussion of the effects of steroid use, check out the Cushing’s Syndrome section. Cushing’s Syndrome is a naturally occurring disease, the symptoms of which are due to excessive steroid levels. At Vetrica, we only use steroids as a last resort in the treatment of arthritis, (mainly as the combination drug, PLT. Over time, the body’s ability to produce cortisol can be lost completely, and if we remember just how important this hormone is, serious problems can result. While the dog is taking these drugs, it should be OK, but if they are stopped suddenly, (as occurs sometimes when people think they’re not working, or if you run out of them during the holidays), the dog can collapse and die. If your dog is taking steroids, they must be withdrawn gradually. Do not stop administering steroids until advised to do so. At Vetrica, our steroid of choice for oral use is prednisolone. It has a short duration of action making it suitable for use on alternate days. This is very beneficial to the dog’s ability to keep producing cortisol, as it allows some recovery to the natural hormone producing system. There are many of these licensed for use in animals, but only one for the dog in the UK, and that is pentosan polysulphate, (Cartrophen Vet®; not to be confused with carprofen). This drug is given by injection at weekly intervals on four separate occasions. The drug acts in many different ways, but can be simplified as an enhancement of the regenerative and a slowing of the destructive processes of cartilage metabolism. Pentosan polysulphate is in the only class of drugs used to treat arthritis that relieves pain by actually improving the condition of the joint. It’s worth noting again here that steroids and some NSAIDs, such as aspirin speed the progression of arthritis. The response to Cartrophen Vet® is quite variable; in some dogs, no other treatment is required for many months or years; in others, there is no effect at all. Approximately 80% of dogs show a worthwhile improvement, but most of this improvement is not evident until the third or fourth injection, so just giving one injection to try is not suitable. Cartrophen is virtually side-effect free. Dogs with certain types of cancer should not receive it though. The active components of the animal derived products are thought to be chondroitin and glucosamine. The use of chondroitin and glucosamine has been gaining acceptance medically, and at least in certain individuals, there does appear to be a beneficial effect. Side effects are generally absent, and some manufacturers are even including them in dog food. Treatment with these products is expensive when compared with most NSAIDs. A beneficial effect is slow to appear. At least six weeks treatment is required as a reasonable trial, although some of the newer products appear to show good improvements within a couple of weeks. Not every dog with arthritis will benefit from the use of nutraceuticals, but a trial of these products is well worthwhile in most cases, especially where the dog is on permanent medication. When all other therapies have failed, it is occasionally possible to relieve arthritis surgically. Ideally, replacing the joint with an artificial one. Most joints are far too complex for this though, and in the dog, artificial joints are available for the hip only. See the hip dysplasia section for more details. The other main surgery performed on arthritic joints is called arthrodesis. This refers to the permanent fusion of the bones which make up the joint. It involves cutting away the cartilage covering the end of each bone, and then joining the bone ends by means of metal plates, screws or pins. The result is a joint which has no movement. It sounds drastic, and wouldn’t work for highly mobile joints like the hip or shoulder, but in less mobile ones like the hock (ankle), or carpus (wrist), it can work quite well. In general, the outlook is quite good. 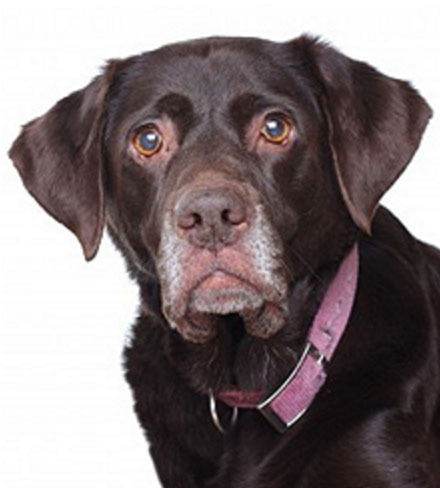 Most dogs with arthritis lead good quality lives, as long as you don’t expect too much of them. These dogs are unlikely to be suitable for use as gun dogs, or police dogs, but pets are able to take life much easier. It is very important that you keep your dog’s weight under control. Unfortunately, a few dogs are permanently severely lame and resistant to treatment, though mostly this is due to obesity. You should seriously consider what sort of quality of life your dog has if it is this bad. Euthanasia may be the kindest option for severely lame dogs.